It's times like these, I wish I could crochet instead of half-assedly knit. Craftser user EnemyAirShip taught herself to knit a little while ago by watching YouTube videos. 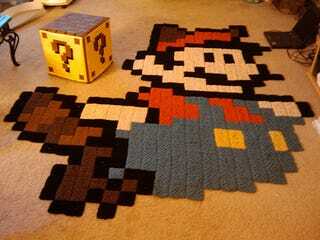 She started with granny squares and then orchestrated a the pixelated pattern that become the Mario rug, which now lives in her living room. I finished him in 15 days (approx. 120hrs put in)! It took 13 days to complete all the individual granny squares, then 2 days to sew them all together. I made an Excel spreadsheet with columns and formulas detailing the number of granny squares needed for each color, then used this to track my daily progress (like a true geek, haha) and motivate me to keep out-doing myself. And that right there is why I won't learn to crochet. Or even knit slightly better than half-assedly. I just don't have follow-through like that!